Hello, hello! Welcome to a very special Summer Release Stampede! We are thrilled to bring you this splashin' release of 6 new stamp sets and 7 Creative Cuts dies! The new release is live and available purchase at our store www.mamaelephant.com as well as at many of our retail partners around the world! 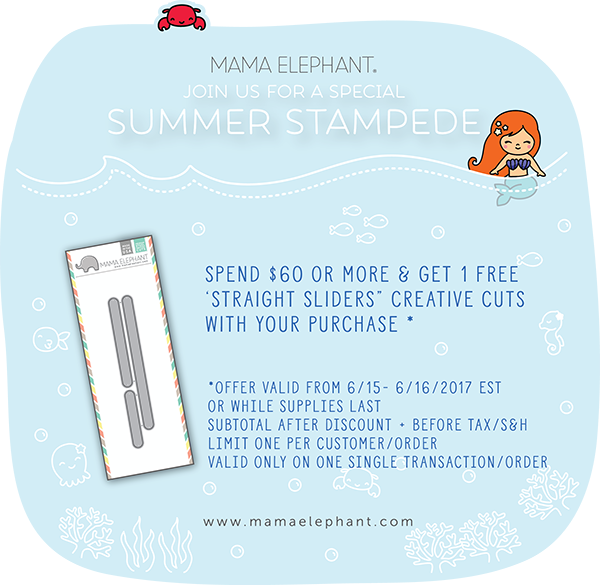 For 2 days only, a brand new straight slider set with any purchase over $60 is yours! I have two cards for you today! Here's my first using Mermaid Kisses and the freebie Straight Sliders dies. It's such a fun little card with the mermaid bringing the pearl in the clam to her splashin friends. Here I'm using my other favorite set of this release, Dim Sum Fun in a shaker card! Personally, I don't really do a lot of punny sentiments, my have to admit that kids love them, as corny as they are sometimes! And it doesn't get any punnier than the sentiments from Dim Sum Fun! Since this is a special release, we've got to bring in some super special people to join our Design Team, right? I can't think of a more stellar line-up than this right here! I LOVE LOVE LOVE your stamps!!! Keep up the GREAT design work!!! I also like/follow on Instagram - my fave place to get Mama Elephant inspiration!! Adorable release!! Already picked up a couple of these little cuties 😊 The dim sum set is just too sweet! Sweet cards! I really love the mermaids, little boys, and little girls in this release. So much cuteness! These new release is super cute and sooo sweet...I love It!!!! I adore all the Little Agenda sets! I must have the new Little Boy and Girl sets!! LOVE Mama Elephant!! Quality is outstanding as is customer service! :) so excited about the new releases! So excited for this release!!! It's so exciting to have another Stampede celebration. The Mama Elephant designers knock it out of the park every time. Just watched Jennifer McGuire make cards with these new releases and I was so inspired by the new designs. Love love the mermaids we are pretty obsessed with mermaids around here. I would love to win these to add to my stamping collection especially for one special little girl. The cards are so pretty. Too cute. I love the little Dim Sum Fun set. oh gosh, such pretty cards! love how magical the mermaid looks! I love your stamps! They are so cute! I want to get my hands on some! I love everything about this release!! Very cute slider and shaker card and marvelous release. In the world of little stamped people, these are some of the cutest. Thanks. You are liked on FB!! Fun release and fantastic hop. Very cute release! Both cards are so fabulous and fun. I love this release! It is adorable! These are soooo Cute I can't stand it!!! Love the boys and girls!!! I love how the mermaid card turned out so cute! I think the Mermaid Kisses and the Fish Bowl die set are my favorite from this release! I love the new Dim Sum set so much! Both your cards are gorgeous! I've reposted on Instagram (not_magda)! And what a great release, love it! Thanks for the opportunity! Loving the new little boy, girl, cat & dog agenda stamps.I simply love all of your stamps and dies. Can't get enough of them. I love it!! So cute!! Both cards are adorable. Love that little mermaid with the slider!! Love the little dumplings - such a cute and original idea! Adorable images in this release. Looking forward to seeing what the design team has created because your cards look fabulous! What a great release. There are SO many fun stamp sets and dies. How to choose?????? The cute octopus just cracks me up! I luv to eat dim sum! So those stamps are so cute! The dim sum is adorable! Super cute and punny!!!! Also following on IG now. Can't wait to see even more cuteness in my feed! The dim sum set is sooo cute! Such sweet cards! Love the new stamps and dies! I follow you and Instagram. LOVE your adorable images; they make me smile! I follow you on Instagram--lucky me! I love these little boys and girls and the window grid is so cool. Great designers for the blog hop! 1. Awww!!! Such adorable release!!! Both these cards are totally sweet!!! beautiful release & the card is lovely! I'm always excited to see the new products from Mama Elephant! I follow on FB and shared about the hop (Amy Maddux Cooley). I follow on Twitter and retweeted about the hop (@acools). I follow on IG (@amymadduxcooley). Awesome release. So much cuteness on this hop. Wonderful release. So many great ideas across the blog. I LOVE the little dim sum characters!!!!!! Super cute cards and images! I love the bit of pearlized color added to the mermaid card to reinforce the sentiment. Adorable cards! I love that dim sum set. Thank you so much! Wonderful blog hop and so many creative cards. Love the dies/stamps that were used. I have a wish list started. I follow you on Facebook, Instagram and subscribe to your news letter. Thanks for the hop. I love the images. So cute!!! I love mermaids! Congrats, on another great release! I absolutely love the dim sum set! I have been waiting for a dim sum stamp set to come out that screamed ultimate cuteness and this is the one! Oh my, so so cute, especially the dim sum, really really fun! Cute card love the mermaid. Love love love the new release especially the dim sum stamps!!!! What an amazing release love it! Loving this release! Awesome products! Liked on Facebook and following on instagram. Love the adorable dumpling sentiment and your sweet little mermaid slider scene! Liked & shared on Facebook. Following on Twitter and retweeted. So cute!! Got to get the agenda boy and girl set!. Such an awesome release !! They are so cute! I want them all! The dim sum set is too cute!! Great release!! I love the dim sum set! It's so cute! Pretty cute stamps and I love the dies! Absolutely adorable!! So glad I found your products!! Love the dim sum release!!! I love getting dim sum on saturdays with my parents! I think i may just have to buy that dim sum set! Love the new set of Dim Sum. Very cute.